The annual partnership welcomes students from Criti Care to shadow Orange County Fire Rescue’s busy emergency medical services (EMS) system and gain real-world experience in a bustling metro department. A total of 21 students traveled from Canada to Orange County to embark on a challenging and memorable experience. 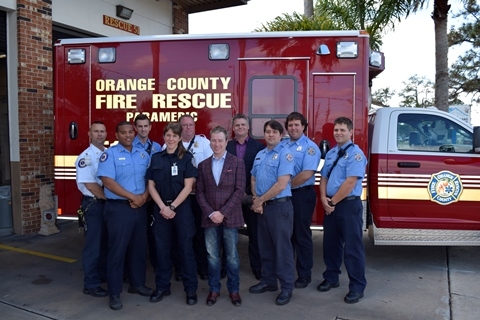 The partnership with Orange County Fire Rescue and Criti Care began 14 years ago when Sommers was looking for an enhanced educational opportunity to provide to his students. Orange County Fire Rescue fit his criteria of a department that experiences a large breadth and volume of calls along with recognized quality of service in clinical care. “This opportunity with Criti Care occurs once a year, and it is a great time for our firefighters and paramedics to share their knowledge with students who may not typically respond to the intense pace of calls we have in Orange County,” said Orange County Fire Rescue Chief Otto Drozd III. Students in the Criti Care program begin in a classroom where they are educated on EMS full-time for six months. After the completion of their courses, they begin clinical practicums in the field with Orange County Fire Rescue. Firefighter/paramedics from Orange County Fire Rescue serve as mentors to these students. The students worked three, 24-hour shifts over a one-week period. The paramedic students will officially begin their careers in EMS in August upon passing the national exam in Canada.